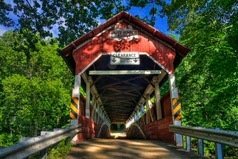 There are ten remaining covered bridges in Somerset County. This county also has the distinction of having the highest point in the state of Pennsylvania, which is Mount Davis with an elevation of 3,213 feet. I can vouch for this, I think I came down an old logging road looking for a covered bridge and it was straight down. Sometimes GPS units can be deceiving. 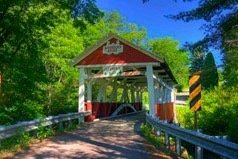 Somerset County has some of the most beautiful landscapes to show off their beautiful bridges. 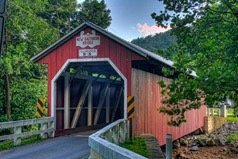 I have found in all the counties I have visited through out our state photographing covered bridges, that our western counties have some of the best maintained and landscaped properties around these structures. There has been a lot of money and effort spent toward the reconstruction and upkeep of all their bridges. Barronvale Bridge was built in 1902 and utilizes the Burr Truss. The bridge crosses Laurel Hill Creek in Middlecreek Township. The structure was bypassed by State Route 3014 in Barronvale. The length of the bridge is 162 ft. 3 in. and the width is 13 ft. 10 in. Barronvale is privately owned and in good condition it is only open to foot traffic. The date of construction for this bridge as noted on the name plate is 1830; but like all our covered bridges that are differences in the date. The state survey lists it as 1846 and the World Guide to Covered Bridges and Zacher list it as 1902. 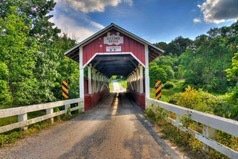 Burkholder (also known as Beechdale) Covered Bridge was built in 1870 and used the Burr Truss in its construction. The bridge crosses Buffalo Creek in Brothers Valley Township, the length of the structure is 52 ft. and the width is 12 ft. it is in good condition and open to vehicle traffic. This structure is owned and maintained by the county. Glessner Bridge was built in 1881 by Tobias Glessner, he utilized the Burr Truss in its construction. The bridge crosses Stony Creek in Stony Creek Township north of Shanksville, Pennsylvania. Glessner is 90 feet long and 12 feet wide, it is in good condition and open to vehicular traffic. This structure is owned and maintained by Somerset County. King's bridge was built in 1906 and used the Burr Truss, it crosses Laurel Hill Creek in Middlecreek Township west of New Lexington, Pa. it has been bypassed by State Route 653. The bridge is 127 feet long and 12 feet wide, it is privately owned and in excellent condition, this bridge has just recently been refurbished. This is another bridge with conflicting dates of construction, the date that use to be posted on the bridge stated it was built in 1802. This would be hard to believe because the bridges in this area were not built until the later part of the nineteenth century. 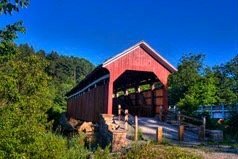 The World Guide to Covered Bridges has it listed at 1906. 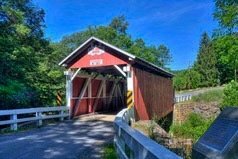 Lower Humbert (also known as Faidley Bridge) was built in 1891 and crosses Laurel Hill Creek in Lower Turkeyfoot Township. The Burr Truss was used in construction of this structure, it is 126 feet long and 12 feet wide. Humbert is in good condition and open to vehicular traffic, the county owns and maintains this bridge. I really enjoyed photographing this bridge, there were so many angles I could get into for a good shot, this does not occur at other bridges with all the under growth. This is one structure that made a terrific model. This bridge was built in 1879 and crosses the Raystown Branch, Juniata River, it is 86 feet long and 12 feet wide. The construction of this bridge used the Multiple kingpost, it is in good condition and frequently used by vehicular traffic. The bridge is located in New Baltimore, Pa., on Township Route 812. Somerset County owns and maintains this bridge. This was another structure I had fun photographing. Packsaddle (also known as Doc Miler Bridge) was built using the Multiple kingpost design, the year of construction was 1870. The bridge crosses Brush Creek in Fairhope Township, the structure is 48 feet long and 14 feet wide, it is in good condition and open to vehicular traffic. Packsaddle is owned and maintained by the county. This of course is not my favorite bridge in Somerset County, but it most certainly is my most favorite landscaped bridge that I was ever fortunate enough to find. You have to go over a steep embankment downstream from the bridge to get to the creek floor, once you do you will be twice rewarded. The setting of this bridge is over a gorgeous water fall, I was lucky enough to be there when the flow was substantial for a good photo. 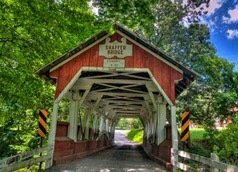 Shaffer's (also known as Bens Creek Bridge) was built in 1877 and crosses Ben's Creek in Conemaugh west of Bens Creek, Pa. The bridges length is 68 feet and the width is 13 feet. it is in fair condition (leans a little). This bridge is open to vehicular traffic and is owned and maintained by the county. 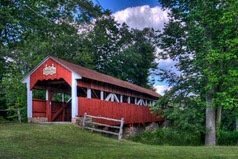 Trostletown (also known as Kantner Bridge) was built in 1845 and uses the Multiple kingpost in its design, it crosses Stony Creek in Quemahoning Township in Stoystown Lions Club Park. The bridge is 104 feet long and 12 feet wide, it is in fair condition. The bridge is suppose to be opened to foot traffic but it would be difficult to cross it with all the equipment that was stored inside. The structure was surrounded with a beautiful landscape and did give a photographer some nice angles, except a nice depth shot, this was because of all the equipment and not being able to see the other side of the structure. Trostletown was taken over in 1965 by the Stoystown Lions Club which undertook the job of restoring and preserving the bridge. 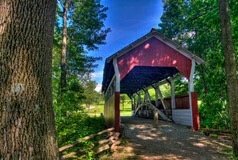 Walter's Mill / Coxes Creek Bridge was built in 1830 utilizing the Burr Truss. The bridge crosses Haupts Run in Somerset Historical Center grounds. 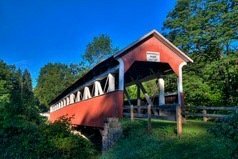 The bridge was built by Christian Ankeny and Jacob Walter and was originally located over Coxes Creek four miles south of Somerset, Pa. The bridge is 60 feet long and 12 feet wide, it is in good condition and only open to foot traffic, this structure is owned and operated by the state. The landscape around the bridge is well taken care of and their are many more photo opportunities besides the bridge to be found on the Historical Center grounds.